Closer to a Thai Curry than the usual Indian, a Thindian more like it, this will go down a treat. 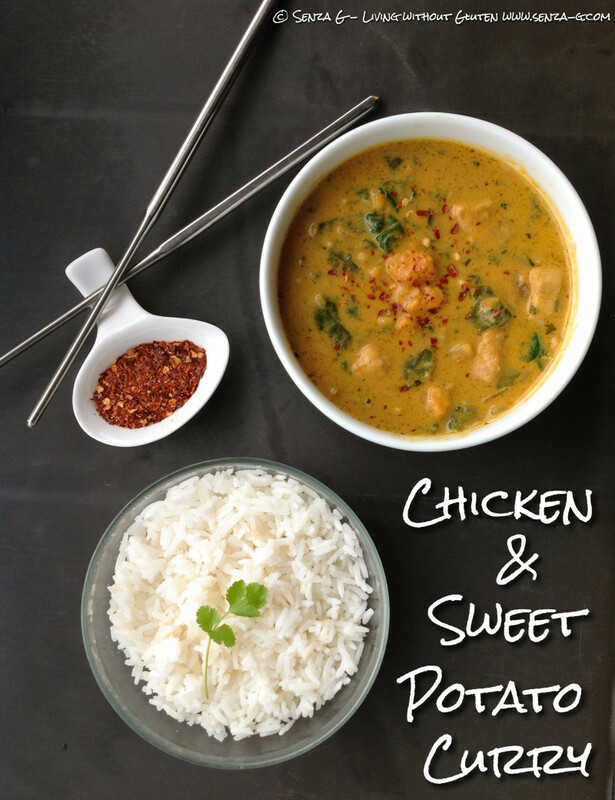 Chicken, sweet potatoes, onions and spinach, simmered in a blend of spices, Kaffir leaves, lemon grass and coconut milk. I have used dried Kaffir and lemon grass as I do not find them available fresh but it still turned out delicious! Put the chopped sweet potatoes in a pan, cover with water and boil for 8 minutes. Drain and set aside. Saute the onion in a little vegetable oil until soft. Add the chicken pieces and cook until they turn golden. Add the garlic, celery, ginger, curry powder or paste, turmeric, paprika, chilli, tomato paste, dried lemon grass and stir these into the chicken pieces until all is well combined. Add the chicken stock and the Kaffir leaf. Bring to the boil and add the sweet potatoes. Lower the heat and stir in the coconut milk. Cover and cook over a low flame until the chicken and the potatoes are tender. Add the spinach leaves and cook until they wilt. Swirl in some coconut oil before serving. Serve with plain boiled Jasmin Rice.